Happy, Happy Weekend. There are a lot of events happening this weekend in Boston, and a lot of fun budget-friendly events too. There was a lot of information and events floating around this week, and I tried my best to capture and compile everything, but I’m sure I missed a few gems. A few events from last weekend were rescheduled for this weekend, and there are also a lot of fabulous Marathon Relief Fundraisers happening this weekend and beyond. Eventbrite has a great list of them all here and Eater Boston has a few delicious suggestions for Marathon Relief through Restaurant support. Speaking of Restaurant support, please consider supporting restaurant staff a little extra in the upcoming weeks, especially Boylston Street establishments. Even a 26.2% tip helps, and hopefully won’t hurt your budget too much. If you do head to the Back Bay this weekend, please remember that meter parking in the Back Bay is free through Sunday. 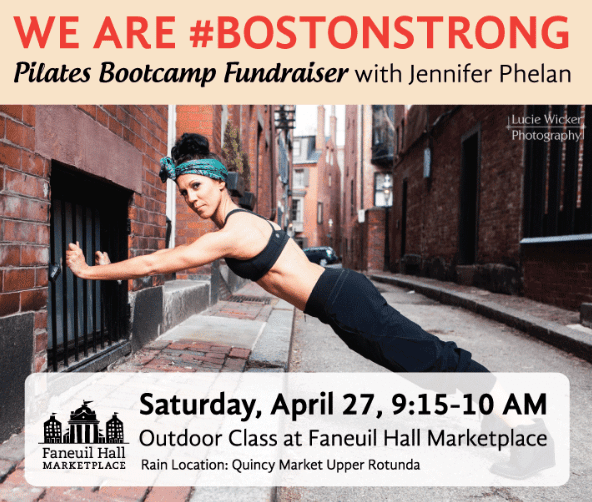 Jennifer Phelan Bootcamp Fundraiser : Saturday, April 27, 2013 at 9:15am at Faneuil Hall West End Promenade (note: location is different than usual). Join Bootcamp instructor Jennifer Phelan for a free Saturday morning workout to raise funds for One Fund Boston. Free, but donations of any size for One Fund Boston. Please bring your own mat. Ultimate Spring Workout: Saturday, April 27, 2013 from 10am-1pm. Get in shape with free fitness classes all morning long with 45-minute sessions happening every 15 minutes! Even better, $2 will be donated to the One Fund Boston per attendee thanks to Ultimate Bootcamp and popchips. To RSVP, please click here. Park Serve Day: Rescheduled to Saturday, April 27, 2013. Show your appreciation for local parks and beaches by volunteering to plant flowers, clean coastlines, clear trails, and more. Free. To find your local park serve project or to RSVP, please go here. Institute of Contemporary Art: Saturday, April 27, 2013. The ICA in Boston is free the last Saturday of every month, which is this weekend! Harvard Arts First Festival: April 25-April 28, 2013 at Harvard University. Enjoy one of the largest University Art Festival with over 225 presentations with over 100+ free events. Harvard Art Museum: Saturday, April 27, 2013. From 10am-12pm on Saturdays, Massachusetts residents can explore the museum for free with proper Mass ID. Harvard Museum of Natural History and Peabody Museum of Archaeology and Ethnology: Sunday, April 28, 2013. Mass residents can visit the Harvard Museum of Natural History and the Peabody Museum of Archaeology and Ethnology for free on Sundays from 9am-12pm with proof of residency. Free Grilled Cheese Day at Cheeseboy: Sunday, April 28, 2013 from 1-6pm. Celebrate Free Grilled Cheese Day at Cheeseboy with… you guessed it… Free Grilled Cheese at Cheeseboy. Hope you enjoy the beautiful weekend ahead! Here are the weekend events in Boston and beyond for this Presidents day extra long weekend for February 16-18th, 2013 that are free or almost free! AAAS Family Science Days: Saturday & Sunday, February 16-17, 2013 from 11am to 5pm. Meet scientists, browse interactive exhibits, tour the universe and much more. Free. Chinese New Year Celebration: Saturday, February 16, 2013 from 3-5pm at Villa Victoria Center for the Arts (South End). Celebrate Chinese arts and culture with traditional dance, music and Chinese appetizers to celebrate Chinese New Year. Free. Harvard Art Museum: Saturday, February 16, 2013. From 10am-12pm on Saturdays, Massachusetts residents can explore the museum for free with proper Mass ID. Harvard Museum of Natural History and Peabody Museum of Archaeology and Ethnology: Sunday, February 17, 2013. Mass residents can visit the Harvard Museum of Natural History and the Peabody Museum of Archaeology and Ethnology for free on Sundays from 9am-12pm with proof of residency. Lincoln at AMC Theatres: Sunday & Monday, February 17-18, 2013. See the movie Lincoln at AMC Theatres for $5 in honor of Presidents day with this printable coupon. Also, since next week is February Vacation week, I will not be posting a round-up of the best ski and snowboard deals on Sunday for the week. Most ski promotions are not valid during school vacation week. However, you can still save a little money with Liftopia (affiliate) so check them out if you are heading to the slopes in the near future. What are you doing this weekend? Do you have a three-day weekend to enjoy?